It has been well established that land plant non-symbiotic hemoglobin (nshb), symbiotic hemoglobin (shb) and leghemoglobin (lb) genes are interrupted by 3 introns (IVS-I, IVS-II and IVS-III). Here, we report the detection, PCR-amplification and DNA sequencing of a 4 intron-containing nshb (nshb2) gene from the Physcomitrella patens DNA. Sequence analysis revealed that nshb2 is interrupted by introns IVS-I, IVS-II and IVS-III, and by an extra intron (pre-IVS-I) interrupting coding sequences upstream to IVS-I. Phylogenetic analysis showed that P. patens nsHb2 clusters with bryophyte nsHbs, however nsHb2 is divergent from P. patens nsHb1. 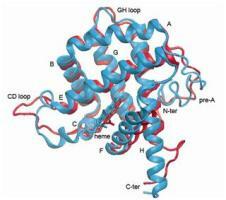 Modeling of the tertiary structure of P. patens nsHb2 showed that this protein could fold into the myoglobin-fold. The existence of intron pre-IVS-I in P. patens nshb2 but not in other known land plant nshbs, shbs and lbs suggests that this intron inserted after gene duplication that originated nshb2. If this is correct intron insertion possibly occurred in land plant nshbs other than P. patens nshb2. This will be verified as novel nshbs become available from newly sequenced land plant genomes.